Microsoft has unveiled a raft of new capabilities for its Teams collaboration tool, including customised backgrounds for video calls, live text captions and integration with its Whiteboard “digital canvas” tool. Those are just three of the features announced as part of a major update to the application at the Enterprise Connect event in Orlando, Fla. on Tuesday, alongside added security and compliance features. Microsoft also offered an update on user adoption, saying there are now 500,000 organisations using Teams. That’s up from 329,000 last September, and 200,000 a year ago, and highlights growth in a crowded market that includes Slack, Google Hangouts and others. Unlike some competitors like Slack, which has 10 million daily active users, Microsoft doesn’t break out individual user statistics. There are more large-scale deployments, too, said Lori Wright, general manager of Microsoft 365. That list includes more than 150 companies with at least 10,000 monthly active users, up from 54 companies last fall. Last month, Facebook said its Workplace also has 150 customers with more than 10,000 users, while Slack has 150 organisations paying for Enterprise Grid, which is aimed at larger deployments. “It is our two-year anniversary and the macro trends that have been going on for quite some time continue to drive the growth and momentum of Teams,” said Wright. Teams is available as part of subscriptions to Microsoft's Office 365 suite, which has more than 155 million individual users. 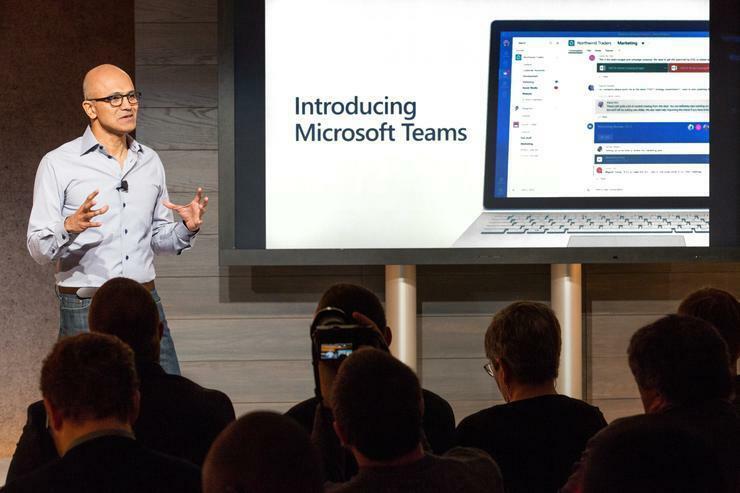 Microsoft also offers a free version of Teams. Since its launch, Teams has been positioned as a core communication and collaboration tool within Office 365, effectively replacing Skype for Business. Among those making the transition are Microsoft’s own staffers: the company said today that 180,000 of its employees have switched from Skype for Business, with Teams used for all communications. However, she added that the monthly active user figures provided by Microsoft don’t necessarily show that Teams is being relied on for team collaboration yet. Daily or weekly active use would be a better indicator, she said. “We’re clearly seeing more experimentation with the platform among a broader proportion of workforces, but it’s likely that this adoption is more through use of the Skype For Business meeting capabilities within Teams than use of the core messaging platform,” said Ashenden. Among the new functions aimed at improving the Teams meeting experience are customised backgrounds, which build on the previously blurred background feature, allowing users to choose the backdrop visible to others during a video call. The aim is to reduce distractions, Microsoft said, and encourage more Teams users to take part in video meetings. With Intelligent Capture in Microsoft Teams Rooms, Microsoft also wants to make it easier for remote participants to see drawings on analog whiteboards during meetings. Intelligent Capture processing can resize, focus and enhance whiteboard images and text, overlaying the information onto a video stream in real time. Customised backgrounds and Intelligent Capture features are slated to roll out later this year. There is also support for Microsoft’s digital canvas app, Whiteboard – which lets users collaborate on creative work and share ideas within Microsoft Teams Rooms. That’s the multivendor conference room control system rebranded from Skype Room Systems earlier this year. That allows content to be moved from a physical to a digital whiteboard without having to replicate the information from scratch. The feature is now in public preview. “With the new content camera and the Microsoft Whiteboard app, we see Teams starting to embrace collaboration that spans both physical and online situations, with the forthcoming Surface Hub 2 also playing an important role,” said Ashenden. Live captions automatically creates a real-time text transcript during a meeting, which is useful for meeting participants who are deaf or hard of hearing, those who struggle with a particular language, or for those connecting from a noisy location. “The live captions capabilities are also particularly interesting as these could help where it’s hard to hear the audio due to background noise or connectivity challenges,” said Ashenden, “but it will also be valuable where meeting participants or audiences are not native speakers. Microsoft also announced features aimed at Teams admins. Private channels is “one of the most requested features” in Teams, said Wright, and allows a certain channel within a team to be locked down for private conversations. The functionality will be available later this year, Microsoft said. The company also touted information barriers designed to help avoid conflicts of interest within an organisation by limiting which individuals can communicate with each other. That should be useful for meeting compliance demands. Finally, new data loss prevention (DLP) capabilities detect sensitive information in Teams conversations to prevent such data from being leaked or shared without authorisation. This is generally available now. Ashenden said the security and governance features will be critical for many highly regulated companies that “see Teams as a way to provide a more secure and compliant alternative” to consumer tools within their organisation. “Security and trust are key focal points for differentiation for Microsoft, and data loss prevention and information barriers provide more controls and reassurance for IT organisations,” she said.